Italian Designer Nash sectional with structure in metal and feet in high-end Titanium, Black Nickel, varnished Micaceaus Brownor or Oxy Grey metal. The cover of this exclusive Italian furniture is available in one of the refined leathers or fabrics of the collection. 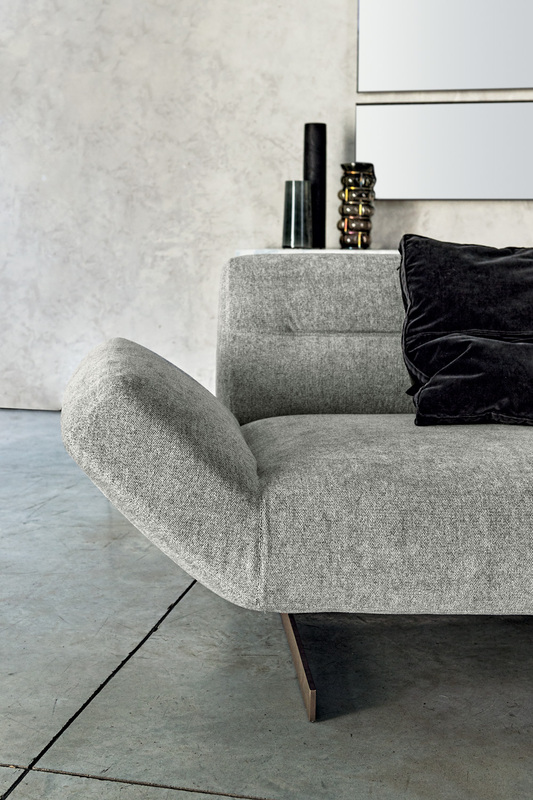 Nash is a futuristic looking sectional, its dynamic and asymmetrical line, its smooth, squared and perfectly defined finishes give it an vigorous and decisive tone. The wide range of shapes, which are compatible and can interact with each other, makes it an extremely versatile model. A unique sectional also available, for a more aggressive look, a special metal zip-back in the backrest. An Italian furniture piece perfect for any Interior Design project with a Contemporary style. Italian Designer Nash sectional with structure in metal and feet in high-end Titanium, Black Nickel,..
Italian Designer Nash Sofa with structure in metal and feet in high-end Titanium, Black Nickel, varn..
Clean and luxury but rigorous forms characterize the Italian designer Aura sideboard. A p..